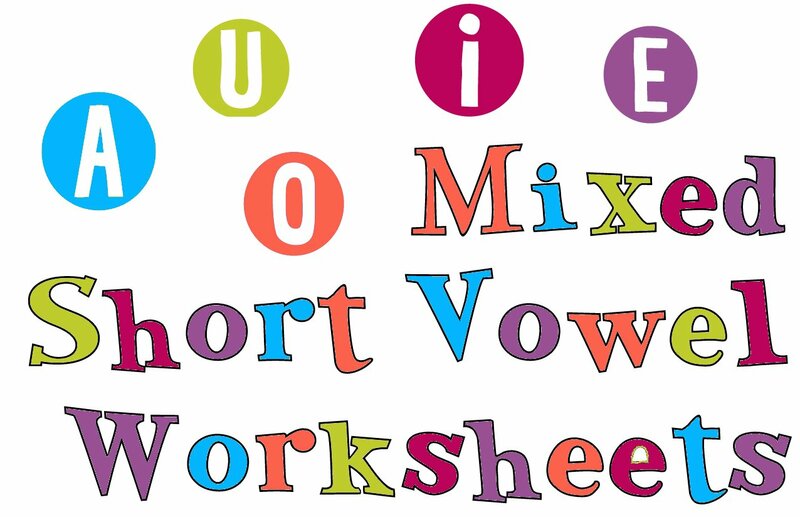 If you've already gone over the individual short vowel sounds worksheets, then your child is ready to try these mixed short vowels lessons. 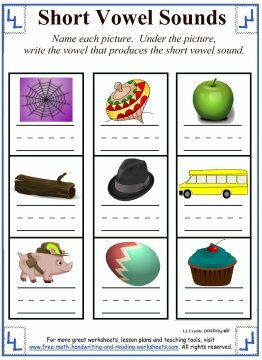 If you haven't done so yet, you can print out the individual vowel worksheets using the links below. 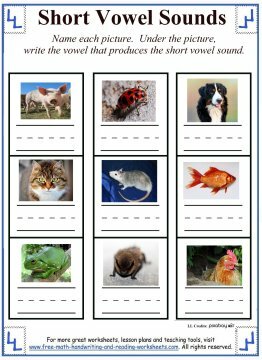 Each lesson in those units will focus in on one of the vowel sounds through six different worksheets. 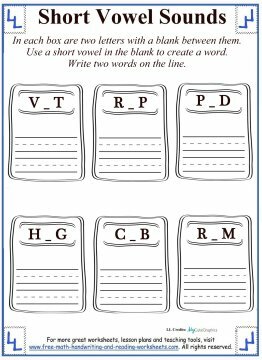 There are coloring activities and writing tasks that will help your child to identify the short vowels in words. You may want to check those out before working on these. There are two different types of worksheets presented below. 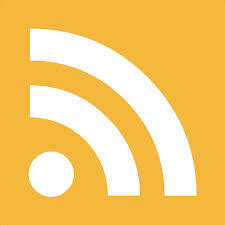 In the first type there are nine boxes. Inside each box is a picture. Work your way through naming the pictures with your child. As you say the word, have your child determine what the vowel sound is in the word. Then, once he or she has the correct vowel, write the letter on the line beneath the picture. The items in the papers below are as follows. In paper one, there is a web, top, apple, log, hat, bus, pig, egg, and muffin. The next one is all animals and it features a pig, bug, dog, cat, rat, fish, frog, bat, and hen (or chicken). 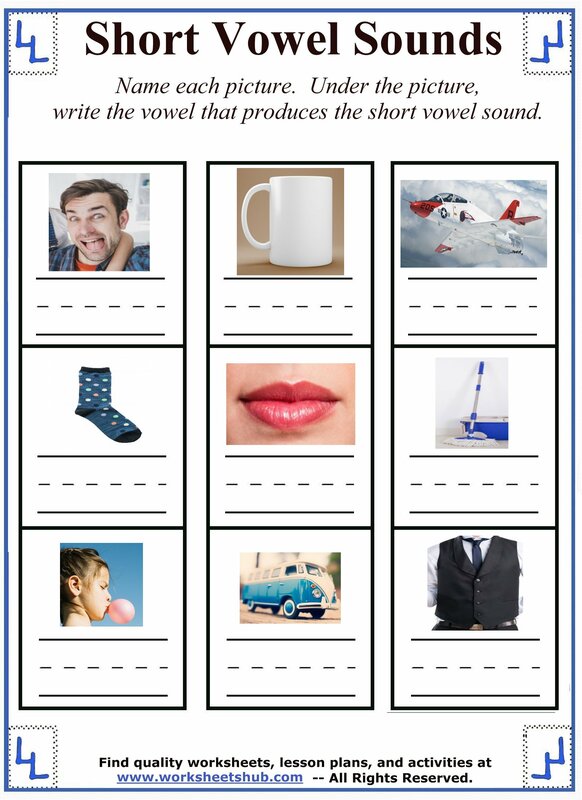 The pictures in the next worksheet are of a man, mug (or cup), jet, sock, lip, mop, gum, van, and vest. If you want to practice more on writing, you can have your child write the entire word out instead of just the vowel. We had to work on writing quite a bit with our son, so this is the route we took. Just remember to work at your child's level and pace. The next set of worksheets all have 6 boxes on them. In each box there is a word that is missing the middle letter, in this case, a vowel. Underneath each set of letters, there are two lines to write on. 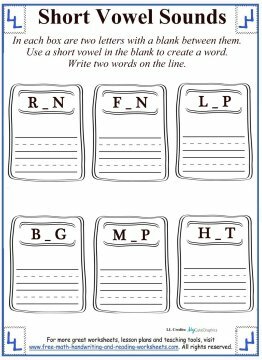 Have your child complete the word by putting a vowel in the middle. Write the word on the lines beneath each set of letters. Each set of letters should be able to create at least two different words by just adding one of the vowels. 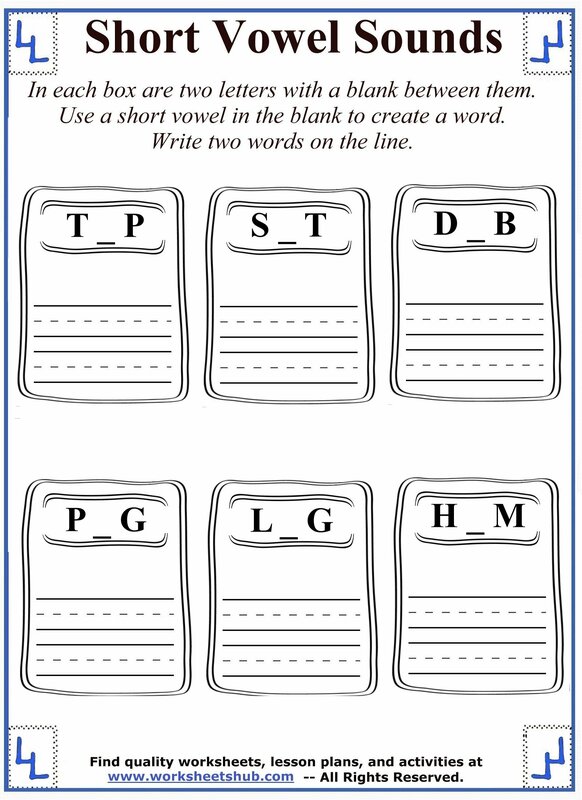 Some letter sets may be able to use multiple vowels to create three or more words.